The Animal Health Trust are asking owners to volunteer their horses to help in their latest ground-breaking study, which aims to help develop guidelines for appropriate rider weight for horses. There is an apparent growing problem of riders who are oversized for their horses. It has become a hot topic within the industry and has thankfully drawn attention to the welfare risk to horses, which the AHT seeks to help resolve. Currently there is a complete lack of reliable scientific research on which to base guidelines for appropriate rider size. However, excessive rider size has clear welfare implications for horses and ponies in all types of work. 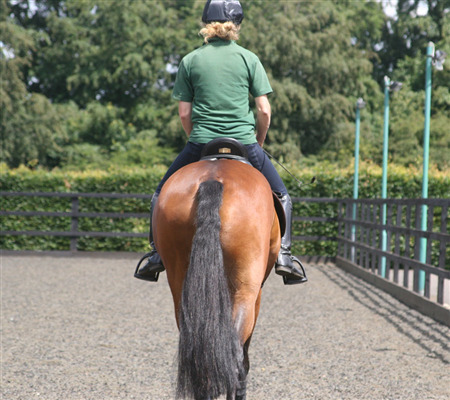 Riders which are too heavy for their horse or pony can cause chronic back pain and lameness, as well as giving the horse a negative association to being ridden as they pre-empt pain. There is therefore an urgent need to start to provide some evidence-based guidelines to the equine industry as to what constitutes excessive rider size, under different circumstances. The aim of this study is to investigate whether there are any short term measurable differences when horses are ridden. During the study each horse will be ridden by 4 competent riders of different weights. Subjective and objective assessment of gait and behaviour when ridden, measurement of forces under the saddle, heart rate during exercise and recovery, cortisol levels and back dimensions before and after exercise will be assessed. Owners of the horses taking part will have access to free advice from experts in their field, including vets, saddle fitters, nutritionists and professional riders. Your horse will be given a free saddle-fit assessment and any adjustments will also be carried out free of charge. During the study horses will be stabled at World Horse Welfare’s Snetterton centre, under the professional care of the AHT team. The study does not query what size or weight a rider should be, but will investigate the effect of different rider to horse weight ratios. This will enable vets, owners and trainers to determine an appropriately sized partnership. A rider can be heavier than another and still work a horse in good balance and posture. However, regardless of the competency of the rider, if they are too big or too heavy and the horse does not have the core strength to support that excessive pressure, injury will occur. No one wants to see a horse caused discomfort or pain, so this is a step towards a practical solution to an increasing problem. Whether you have a happy hacker that is happy to help, a youngster in need of some life experience, or a riding school horse who would enjoy a change of scenery – the AHT needs volunteers. If you horse is able to take part, they would be helping to take the weight off many other horses’ shoulders, for which they and the AHT would be very grateful.